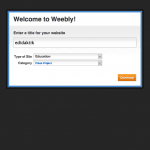 In this guide you will get an introduction to, how to use Weebly in education. After you have created a free profile on Weebly , you must choose whether you want to see a demo, create a class or create a home page. Click on the Create a ‘ Website ’. You now need to give your website a title, and choose what it will be used for in the drop-down-menu. Select ‘ Education. Then select your home page address. 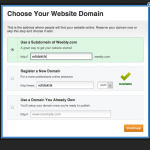 If you select the top option you receive a free address with Weebly. You are now ready to begin editing your home page. In the top menu bar, you can choose between different things you want to edit. Under the ' Elements ' can you add text, images etc. to your page. You simply drag the elements you want on your side down to the white content field. You can for example add an element, that gives the opportunity to obtain answers to various questions from students. If you want to edit an element on your page, e.g. change the text or number of answer options, select the element. You will then see an editing menu. On the tab ' Pages ' at the top, you have the option to change your page titles, and to create new pages and change the order of the pages. You can, among other things,. create a blog, and use it as the ‘ newsletter ’. You can also write a text for debate, which the learners can comment on afterwards. On the tab ' Editors ', you can add other as moderators of the website. It gives the possibility to use the page as a common wiki. 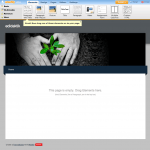 When the page is ready, You can publish it by clicking on the button ' Publish ' in the top right corner. 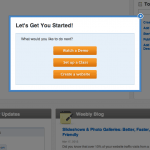 If you need additional knowledge about Weebly's functions, you can read this guide.